Slikdealer.com is the PUP that uses misleading techniques to prevent removal. Use Reimage to locate malicious components and get rid of them faster than with uninstall instructions. A full system scan blocks virus reappearance and prevents traffic to malicious domains. SlikDealer by Aztec Media Inc. is a potentially unwanted program (PUP) that alters browser’s settings as soon as it gets a chance to enter the system. This browser hijacker spreads as ShopperTab browser extension that is supposed to operate as a virtual shopping assistant. However, after the hijack, it alters browser’s settings and sets Slikdealer.com as default search engine. The main task of the Slikdealer virus is to change and control user’s browsing habits. For this reason, this potentially unwanted program (PUP) might alter Windows registry and modify browsers settings. It might affect all popular browsers, including Mozilla Firefox, Internet Explorer, Google Chrome and others. The most important task is to replace browser’s startup page and built-in search box. Soon after the Slikdealer hijack, users find http://www.slikdealer.com/ext/index.html?cfg=cfgD.json set as their homepage URL. As we have already mentioned, these changes are irreversible. 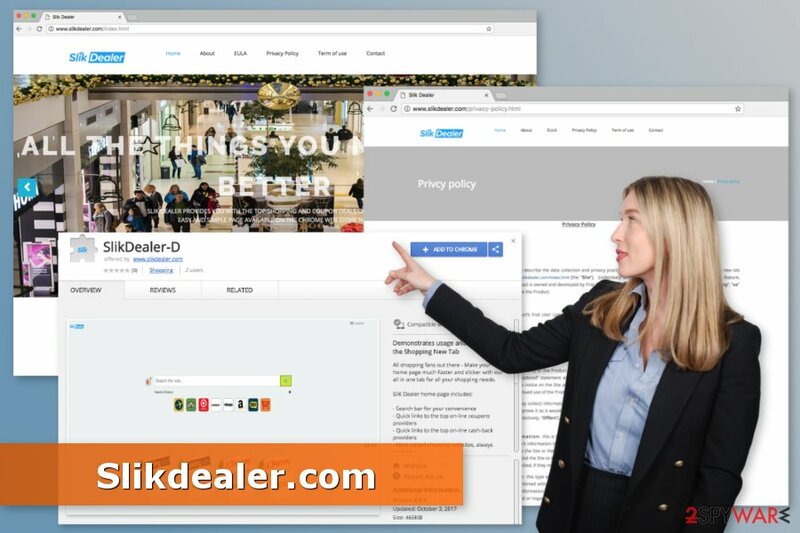 Slikdealer.com might seem like a legitimate and useful search engine, which offers quick access to popular websites, such as Amazon or TripAdvisor. Additionally, it displays shopping offers and has access to various discount coupon websites. The problem is that Slikdealer.com virus can trigger redirects to third-party promotional websites soon as you click on a search result. Thus, instead of finding information on the site, you might be forced to look at online shop or other promotional sites. The problem is that Slikdealer might redirect to potentially dangerous websites too. It means, that you might end up on a technical support scam or phishing site. What is worse, you might be rerouted to a website that spreads ransomware, trojan horses, and other malware. Additionally, after the hijack, you might notice numerous SlikDealer ads popping up on the screen. While some of them might be legitimate and give real discounts, others are misleading and even malicious. Thus, clicking them is not recommended. Apart from causing browsing-related problems and increasing chances to encounter other cyber threats, Slik Dealer might also track both personally and non-personally identifiable information. Therefore, this browser extension might put your privacy at risk too. For this reason, you should not install it. However, if you made a mistake, you can fix it by performing SlikDealer removal. Keep in mind that uninstalling browser extension itself is not enough. You have to look up for other hijacker-related entires and wipe out them from the system. The instructions how to remove SlikDealer.com manually are given below this article. However, you can speed up this process with Reimage or another reputable anti-malware or anti-spyware program. 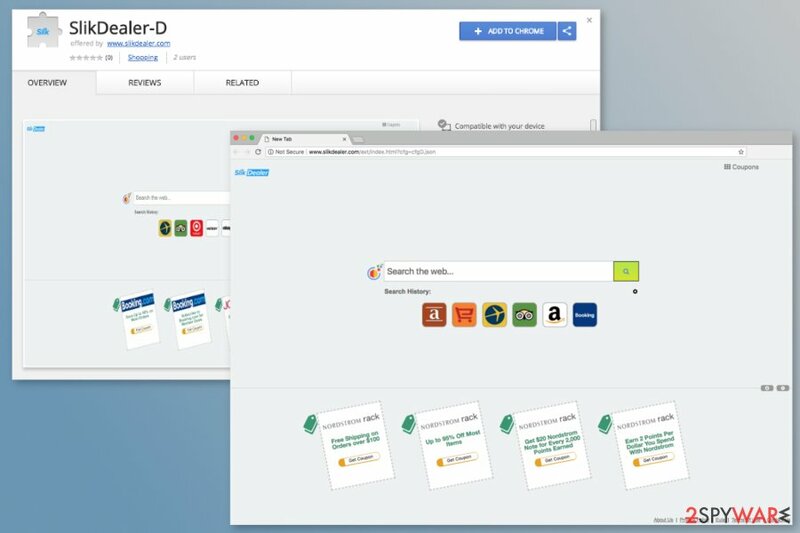 Slikdealer.com is a questionable search engine that spreads as ShopperTab browser extension in software packages. This browser extension is promoted on the official website. However, the download link is inactive. However, users can find it available on Google Play store named ExtensionSlikDealer-D, but direct downloads are not the main distribution strategy, security team from lesvirus.fr say. Sudden and unexpected SlikDealer hijack might occur when you download freeware or shareware using Quick/ Recommended settings. This PUP might be added to the software bundle, and these settings do not inform about additional apps being installed together with the program you need. For this reason, you should never rely on these settings and opt for Advanced/Custom installation only. Then you have to opt out pre-selected “optional downloads” to stop PUPs from entering the system. SlikDealer.com removal requires uninstalling all questionable browser extensions, add-ons, and programs that may have been installed on the computer without your knowledge. The guide below will help you to complete this job successfully. However, if you find the instructions difficult, you can remove SlikDealer automatically. Many tools can help to eliminate this potentially unwanted program. However, we advise choosing one recommended below. Here, look for Slikdealer.com or any other recently installed suspicious programs. Wait until you see Applications folder and look for Slikdealer.com or any other suspicious programs on it. Now right click on every of such entries and select Move to Trash. When in the new window, check Delete personal settings and select Reset again to complete Slikdealer.com removal. Once these steps are finished, Slikdealer.com should be removed from your Microsoft Edge browser. 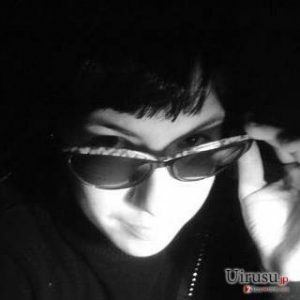 Uninstall Slik Dealer and other suspicious Firefox extensions and reset the browser. Here, select Slikdealer.com and other questionable plugins. Click Remove to delete these entries. Now you will see Reset Firefox to its default state message with Reset Firefox button. Click this button for several times and complete Slikdealer.com removal. Here, select Slikdealer.com and other malicious plugins and select trash icon to delete these entries. Click Reset to confirm this action and complete Slikdealer.com removal. Here, select Extensions and look for Slikdealer.com or other suspicious entries. Click on the Uninstall button to get rid each of them. Here, look at the Homepage field. If it was altered by Slikdealer.com, remove unwanted link and enter the one that you want to use for your searches. Remember to include the "http://" before typing in the address of the page. Now you will see a detailed dialog window filled with reset options. All of those options are usually checked, but you can specify which of them you want to reset. Click the Reset button to complete Slikdealer.com removal process. ^ Margaret Rouse. PUP (potentially unwanted program). TechTarget. Technology news and definitions database. ^ New KOVTER Campaign Spreads via Malicious Advertisements in Pornhub. Trend Micro. Enterprise data security and cyber security solutions. ^ Les virus. Les virus. Cyber security and spyware news. This entry was posted on 2018-02-07 at 05:55 and is filed under Stealing programs, Viruses. You can quickly scan the QR code with your mobile device and have Slikdealer.com manual removal instructions right in your pocket. How did you remove Slikdealer.com?